The past week has been full of kind-of-but-not-really having class, plans being made and falling through, exploring Kolkata, wearing saris, and attending a sitar concert! Friday was Jennifer’s birthday, and Madhu and Munu had invited everyone over to their house to celebrate. 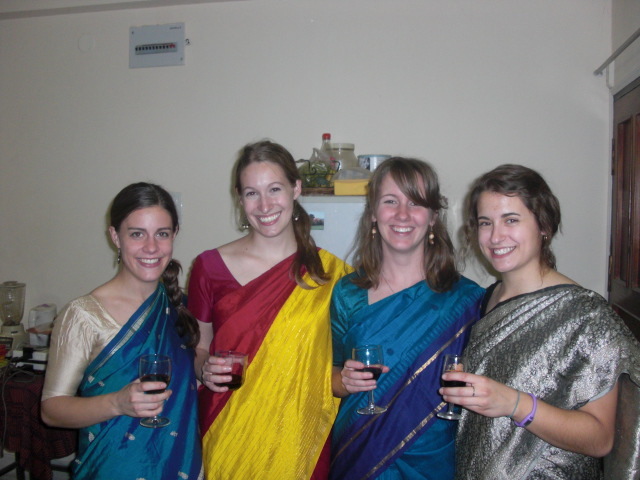 We all went after class and wore saris! Madhu and Munu have so many saris – closets and closets full! The great thing about a sari is that it really is timeless – you can wear a sari for every occasion, they never go out of style, and they will always fit! 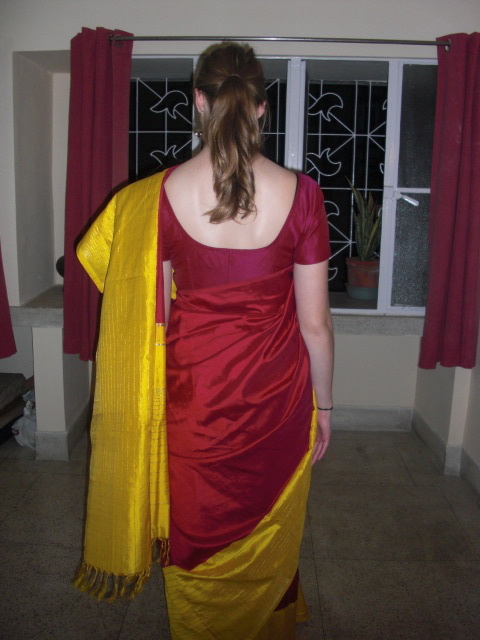 Because it’s just a long piece of cloth, you drape and tuck it around the body so there is no need for sizing. 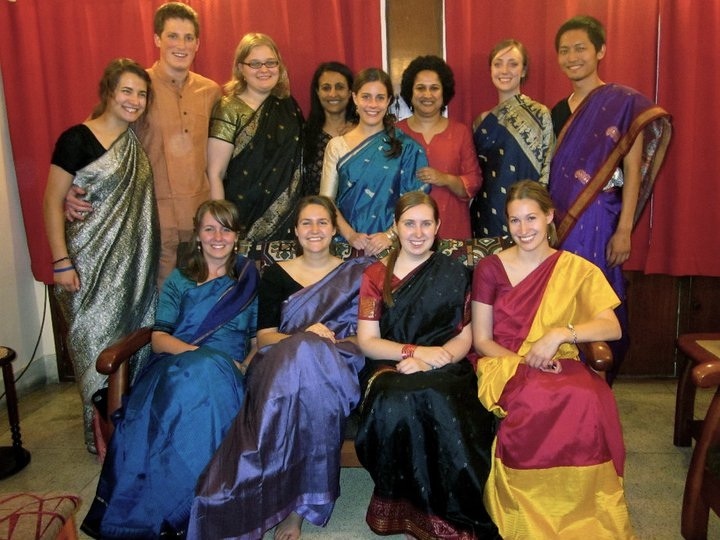 It was great to see everyone dressed up in a sari. We had a great dinner (very spicy dinner though!) and some delicious birthday cake. It was a great party and nice to hang out with everyone. 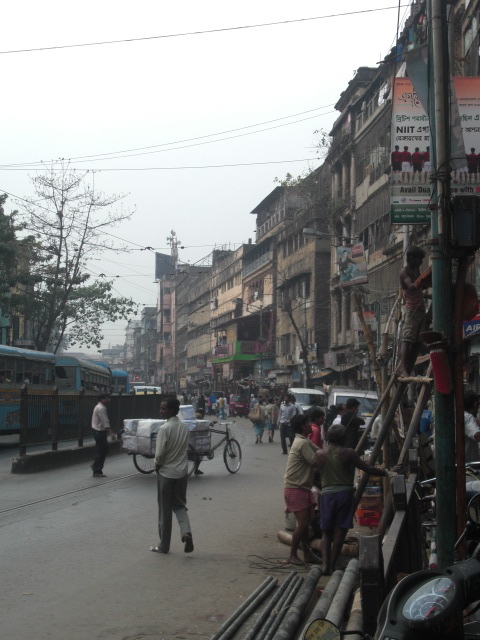 Saturday was spent exploring some more of Kolkata. 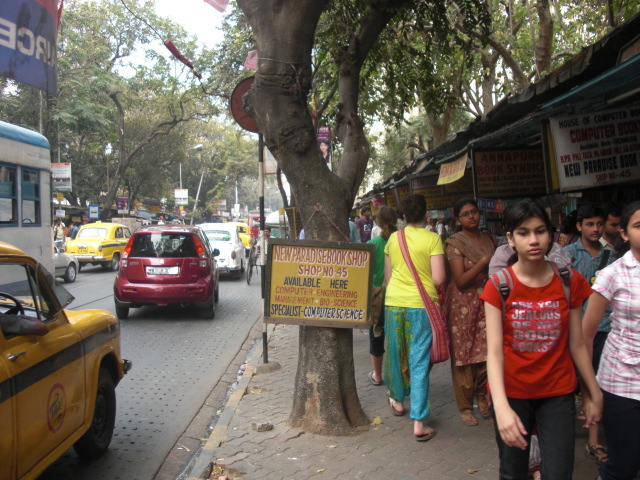 Madhu has given us a few sites around Kolkata to explore on our own for her class, so Saturday we went to College St. It’s a big street here that has many universities and the streets are packed with booksellers. It was okay, not necessarily a lot to see. I’m not sure how anyone would find a book there – there are so many stalls and piles and piles of books! We also stopped in a famous coffee house off of College St – it’s famous for the famous people who used to go there and have intellectual conversations/debates. It doesn’t really look like a coffee house, but more like a dining hall. We started to play cards to pass the exceedingly long time it took to get our coffee – and they came over and told us to stop playing! Apparently whenever you play cards here, they think you’re gambling whether or not you actually are…though they did not tell any of the numerous smokers to stop smoking, despite several “No Smoking” signs. At least the coffee was good. We got home just in time to leave for a sitar concert! Sujoy had arranged for us to go with him to a friend’s house, who arranges concerts and other art related events every few months. It was in a gorgeous spacious flat, and several people were there. The sitar player we saw is one of India’s greatest sitar players, whose father helped invent the modern sitar – whether that meant figuratively or literally, I’m not sure. He was accompanied by two tablas, a kind of drum. It was amazing! They played for 2 hours straight – what endurance! One of the most interesting parts of the concert was seeing the audience’s reactions to his playing – they would make kissing noises, shake their heads in awe, wave their arms, and any other noise/gesture of appreciation. I wish I had a better frame of reference though – this was my first real exposure to the sitar so I feel like I couldn’t really appreciate his talent. And another great part of the evening – j’ai parlé en français! I spoke French! :D I met a Frenchman there, who comes to Kolkata every year to study Indian classical music. It was great to speak French – and I can tell that I’m a bit rusty already! At least I haven’t lost my conversational skills…yet. On Sunday morning, we went to St. Xavier’s to see Danny and Kia in a play! It was a dance drama of the Mahabharata, an ancient Hindu epic. They told us it would start at 11:30am – so we should up a little early. There was music at first to entertain us…but then the music just went on and on without end! 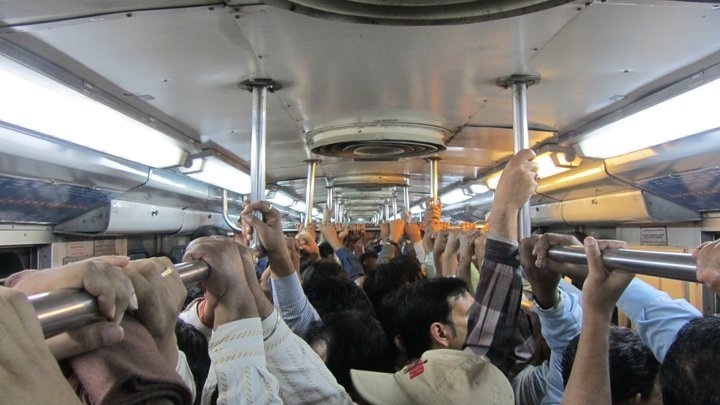 It was the best example of Indian time – and so frustrating!! The actual play didn’t start until 2p.m. No one had any idea what was going on or when the play would actually start, and everyone was taking there time as if everyone else in the audience had all day to spend. Time is just a different concept here – you can’t schedule and plan like at home and you have to constantly adapt to delays and unexpected things. I was getting very frustrated and impatient – mostly because the entire program was in Bengali, so we were just sitting there with nothing to do. So, 2.5 hours of waiting later, we saw Danny and Kia’s 30 seconds in the play and left immediately after to go to the Indian Museum – another site on Madhu’s list. I didn’t have much interest in the museum to begin with, and the exhibits were not very interesting, nor were they designed to be very interesting. For example, there was an entire room full of rocks. Instead of choosing the best 20 rocks, they couldn’t decide and included all 20,000 of them. The coolest parts of the museum was a 4,000-yr-old mummy (not even Indian) and the skull of a blue whale, which is about as big as my bedroom! I spent the rest of Sunday relaxing. I’m really enjoying my book, The Omnivore’s Dilemma, and another one I started today – Being Indian by Pavan Varma. They are both great reads, and I’m learning a lot!! We had a service learning class on Monday, which was supposed to help us better understand the circumstances the behind-the-scenes knowledge of how these girls are in this cycle of poverty and how Loreto is helping stop that cycle. It was a good class, and the biggest thing I learned is that I’m going to have to adjust my expectations and goals of what I’ll be doing there. I won’t be making a huge difference there, and I won’t be able to see any immediate impact of my work there. It’s a little discouraging, but I need to be more realistic. At least my most recent visit to Loreto was more motivating – I spent time with the older Rainbow girls, who are 14-16 yrs old. It was much easier to communicate with them since they speak more English, and they had questions to ask us too. I really noticed that day how much the girls really do need attention – they are constantly touching you, holding your hand, wanting to play with you, and redirecting your attention back to them. Even as I was leaving, I had about 10 girls come up to me grabbing my hand and playing with me until I walked out the door. I liked that so much more than the tutoring – having actual interaction with them instead of just watching them doing schoolwork. I finally felt more needed and useful. On Monday, we also met famous Indian author Amitav Ghosh! We read a couple of his books for Madhu’s class – The Hungry Tide and The Shadow Lines. He met with us and a group of other students and professors for a question/answer session, and afterward we got to meet him for tea! He was really nice and was very interesting to talk to, and what a great opportunity to meet him! I felt bad since a few others and I had to leave early, but at least it was for something also great – our first yoga class! Arundhati arranged for an instructor she has worked with to come to our house to teach us Monday, Wednesday, and Friday each week. His name is Jamal and we do the exercises in our living room. It’s going great so far! It’s a little different from what I’ve practiced at home before, but I’m enjoying it and really happy that we can do it so often for way cheaper than at home! Lately, I’ve been frustrated with St. Xavier’s gross inefficiency. I’ve realized that we will probably never have a full week of class – for example, Bengali was canceled all week, all but one class was canceled today, and class was canceled for tomorrow. That’s not a problem for me – but it’s annoying we weren’t told that classes were canceled today until we arrived, even though the teachers knew well in advance. So instead of coming to school at noon, we could have come at 4pm and could have done so much more with our day! I’ve learned to always bring a book or something with me to fill my unexpected free time that inevitably comes up. Another frustration this week was figuring out the library – for our sociology class, the teacher gives us references but we have to find the in the library and make copies of the relevant sections on our own. I don’t have a problem with that, but the library does not make it easy. It’s very confusing – there is a reading section where you cannot remove those books from that room, and a separate lending section where you may check out those books. Many of the books are out of order and in the wrong sections, which doesn’t help. Apparently when you find the book you need, you can’t just bring it to the table and look at it – you must first bring it to a librarian who fills out a reading slip, which somehow gives you permission to read that book at the table (I don’t understand the purpose of this and need someone to explain this logic to me). If you want photocopies of something, you have to give it to the one guy who makes photocopies, but the times that we tried he was too backed up and we were told to come back in the morning. The other time he was on break, and it’s just all a mess. I don’t know how anyone ever gets anything done here. We were supposed to go along with the sociology department on a trip to the villages this weekend, but unfortunately it fell through :( They are supposed to schedule a separate trip for us sometime later in the semester, and I really hope it happens! So instead, I’ll spend the weekend exploring more of Kolkata! I can’t believe I’m almost at the halfway point of my trip! :/ …expect a more reflective post next time.